The R16 Recorder/Interface/Control seamlessly combines multi-track recording, an audio interface, and control surface capability in a mobile production studio. Take your session anywhere. 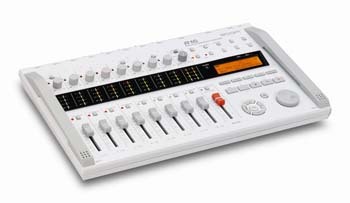 The R16 combines multi-track recording, an audio interface, and control surface capability in a mobile production studio. Click to enlarge. or view device connections. Audio interface with 8-in/2-out capability. Control surface for all major DAW functions. Supports SDHC cards up to 32 GB. Set up to 100 marker points and directly locate them whenever you want. Other convenient functions for editing include A-B repeat playback and auto punch-in/out, making it easy to re-track part of the recording. The R16 can be powered from the supplied AC adaptor or six AA/LR6 batteries. A set of batteries will last for about four and a half hours, and because they are standard batteries, changing them is always easy and convenient.